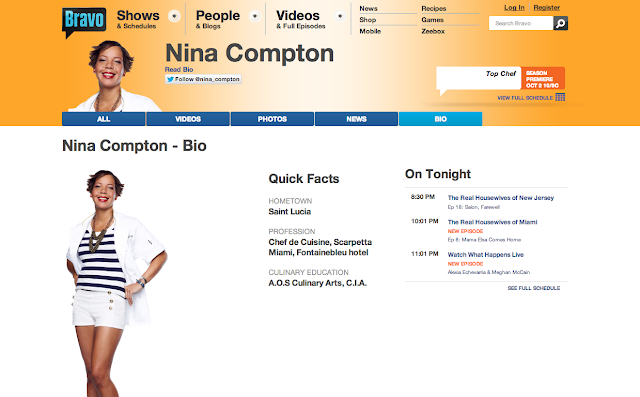 For all of you BRAVO fans, the channel that has brought us 'The Real Housewives of ....' franchises and gave us Andy Cohen, on its eleventh season of TOP CHEF introduces its audience to a St.Lucian contestant, Nina Compton. So full blown Caribbean support is always welcome too! LOL! Top Chef will invade New Orleans this year to crown the culinary world's next big star. Tune in to Bravo on October 2 at 10p ET/PT to watch the premiere. And for those who can't wait, we're also psyched to launch a a new web-only show this afternoon titled Padma's Picks. The exclusive Bravotv.com series will follow host Padma Lakshmi as she selects a Cheftestant to represent the Big Easy in this year's competition. Past Sweet 7 post about Nina Compton. Time to set my DVR and support one of my own!